There are actually a number of different possibilities for the reasoning behind these events. Either one or several of these might be accurate. However, until we have the entire story, it is necessary for us to consider as many probable motives as possible. As we may have noticed, numerous aspects of this incident do not add up. Per the typical situation, the MSM reported a number of details about the incident immediately after it took place, and as we have come to expect, a number of other provable details came forward which mainstream seemed to omit from reports. This has left a good portion of audiences unaware of important facts—facts which might change perspectives about many of the issues facing society. However, we will get to those in a moment. One of the reports offered greater details about the shooting early on. This report came from the website SFGate which reported that the shooter was difficult to identify by some witnesses. Somehow, the suspect was able to acquire a full mask and body armor and enter the premises of YouTube HQ to freely fire her handgun. Here is the quote from a YouTube employee and SFGate.com. We may note that a normal neurotic individual who apparently showed no signs of being murderous or violent prior to this point in her life suddenly decides not only to shoot people, but to do so calmly—much like other mass shooters who were suspected to be under mind control—raises numerous questions. Now let's compare this story with that of NBC News. Below is the video which NBC recently released. The video shows several inconsistencies about the shooting and raises more than a few red flags. 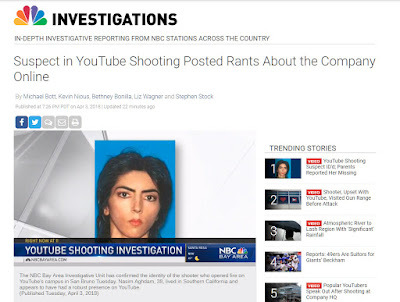 From later reports, we find that the suspect, identified as Nasim Aghdam, was actually found by the San Bruno police hours before the shooting took place. It was reported that these police even assured Aghdam's family that they were keeping an eye on her. However, following the moments when police found Aghdam, she was reported to have visited a firing range. It was after that visit that she somehow attained full body armor and went on her shooting spree. The situation appears to be significantly confusing and particularly suspicious, considering all that has happened in recent times. Let's see if we can narrow down the possibilities. It has been speculated that the recent mass shooting events we have seen were each linked to the FBI and that these events were instigated in order to achieve a repealing of the 2nd Amendment followed by a swift nationwide gun confiscation. This motive appears to have been present when we consider the striking similarities between the numerous mass shootings that have taken place. It could be that this recent shooting was orchestrated by the same bad actors behind the scenes. If this is true, there may be a specific reason why a woman who did not fit the profile of the typical mass shooter was used in this case. 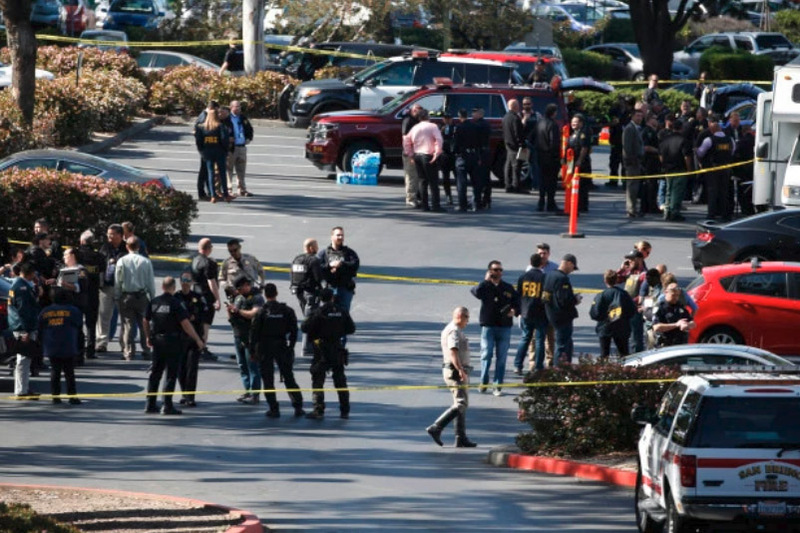 If these same alleged FBI and/or Deep State interests intended to use another false flag shooting at YouTube to achieve some agenda, there are several possibilities. Judging from the above video, it could be that a patsy of some sort was fingered as the shooter. This was suspected to be the case in past mass shootings or bombings. However, in this case, the situation appears to point toward this actual woman as the suspect in question. There are several possibilities behind this deviation from the typical shooting, but we will leave those for later discussion. The fact that the individual never smiles and has a stone-faced expression throughout these scenes seems to suggest that there may have been more to this YouTuber than NBC stated. Upon closer examination of the suspect, it is clear that there is something very off about the content she is said to have uploaded. This is just a hunch, as I am not an expert at mind control programming. However, it seems there is some type of symbolism included within the videos and images still available to the public. The use of the typical MKULTRA symbolism of the rabbit, the chicken, the cow, the leopard (or cat-woman) shows numerous similarities to other suspicious videos believed to contain elements of MKULTRA programming. There is also the repetitive use of animal mask, wigs and other disguises frequently used in these videos. Combined with the clashing voice-overs, the asynchronous music, and the bright colors and patterns, these elements raise questions about the true intent behind these videos. We may also notice that the majority of the NBC story showed no evidence that anything being stated was true. We never heard the name of the YouTube channel. To add, we see a house that was claimed to belong to a Persian family whom a neighbor says was kind and pleasant. As things appear, we have more reason to believe the neighbor than we do the entire NBC report. Granted, all of these omissions could simply be caused by a lack of interest by NBC in reporting these events. However, seeing that the issue of gun violence is so prevalent in news today, one would think that this subject would receive equal coverage as all of the other shootings. Instead, we see a dismissive treatment of the issue similar to what we saw following the Vegas shooting. All of this raises the question of whether or not these NBC news readers are delivering facts, or if they are simply reading a fabricated story displayed on a teleprompter. Here are a few tweets for our consideration. These were posted by various public figures who shared doubts about the situation reported by the MSM. If this recent spree of cookie-cutter shootings are indeed false flags, it is important to realize what might be causing them. If there are interests pulling strings behind the scenes in order to manipulate the public into fear and panic, there may be a number of motives behind these acts. An obvious motive behind these events—one which the media has sustained for years now—is the motive to create fear. When the people are in fear, they cannot think properly, and when they cannot think, they are more easily manipulated. This means the people are easier targets for advertisers and more agreeable to political policies which are disadvantageous to them. The second reason why certain criminal interests may concoct a spree of false flag shootings is that these events may give the preexisting anti-gun narrative more fuel. An unarmed population is easier to oppress than one that can defend itself. Also, more shootings means more airtime for the MSM to exploit children in promoting various other political agendas. Thirdly, shootings such as these act as a distraction from the damning forthcoming disclosures about the Deep State and all of the government criminals which are predicted to come forward very soon. It seems that in a big way, certain interests may have intended to use this shooting to paint the truth community in a negative light. Though they seemed to miss the mark entirely by using an extremist who promoted PETA, these interests may have intended to demonize the alternative community as well as those who were originally censored due to the unethical practices of YouTube. To add, by demonizing the truther community—the very people bringing the disclosures of rampant corruption to the public—elitists may have hoped to discourage the public from turning to the sources through which these disclosures will most likely come. However, there are other possibilities to discuss. Let's suppose for now that the various news reports we have received from the MSM were true with some exceptions of omitted detail. What could be the reasoning behind a shooting of this type? It seems clear that if this shooting was orchestrated by parties beyond the suspect herself, that this shooting was intended to cause fear. If this is true, this incident did not at all appear to be the typical shooting we have seen reported. Here are a few details we know about the shooter. *The police were fully aware of her and met with her hours before the shooting. *She went to a shooting range immediately before the shooting took place. We may also note the fact that this shooting is not being reported by many MSM news outlets with very much emphasis on detail. One would think that if the recent activism against gun violence was truly intended to stop these incidents from happening, these same activists would be all over this scene. Yet we see no one. There is no David Hogg, no Emma Gonzalez, no #NeverAgain signs, and no blanket news coverage by CNN or any of the usual MSM players. What happened to all of the activism about stopping gun violence? It was only a week ago that the March for Our Lives took place, and yet when another shooting happens, there is silence? What's really going on here? Were the recent protests to stop gun violence directed toward stopping all violent incidents, or just some of them? Why discriminate when it comes to human life? 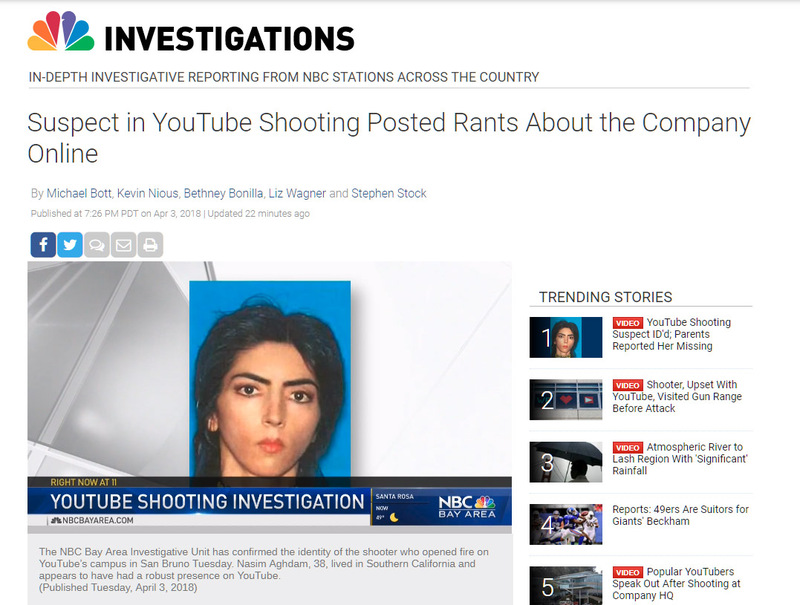 This YouTube shooting did involve a troubled individual, according to reports. However, the profile of this woman did not at all fit the stereotype of individuals the media typically targets. The shooter was not a man, not an NRA member, and was an immigrant of Turkish decent. She was allegedly a PETA member, animal lover, and a fitness buff. To add, the woman did not use an AR-15 or bump-stock to commit the shooting. Instead, she used a handgun. Politically speaking, this shooter was the exact opposite of the stereotypical mass shooter which the corporate media has promoted as the sole cause of gun violence in modern America. It seems that this individual leans significantly toward Leftist ideals. This would reveal that the issue of violence cannot simply be thrown at one side or the other, nor can it be used as an excuse to recklessly promote political agendas in place of real solutions to gun violence. As with any problem we face in life, we must do our due diligence and understand the details of the issue before attempting to solve it. Instead of blindly conforming to MSM narratives, it is vital that we show the initiative and independence of thought necessary to move forward. In the wake of situations like this, it is difficult to know what truly happened. Is the corporate media telling the truth about this incident? Did police willfully refrain from stopping this individual from injuring these YouTube employees? If not, what stopped them from watching her as they claimed? It could be that the would-be shooter had nothing suspicious on her person or in her car prior to visiting the shooting range. This may have been why San Bruno police allowed her to leave. However, there is still the issue of the body armor. Where did this women attain this full body armor and mask, and why did police not continue to monitor the suspect when she approached YouTube headquarters. The police had been warned about her and knew that she had animosity toward YouTube. Did these police neglect their jobs, or did they intentionally allow this shooting to happen? Aside from these possibilities, this operation may have either been a hit job by dark-hats that did not go as planned, or it could have been a false hit job by another criminal organization intended to expose the first. Of course, there is always the possibility that none of these events occurred the way which the MSM has reported them. It could be that the woman, the family, the YouTube channel, along with its supposed millions of views were each fabricated for unstated purposes. Whatever the case is, if the report is largely true, it is unfortunate that another troubled individual allegedly felt the need to harm others and end their own life in the process. Considering what we have seen from the questionable FBI and the apparently uninformed or misinformed corporate media, the report on this shooting appears significantly partial at best. In my view, there is a very strong chance that either the police or the FBI was directly involved in the shooting. As in past shootings, the culprit was most likely under the supervision of authorities and may have even been on psychiatric medication prior to the shooting. The fact is sad, but (alleged) false flags in the United States have happen enough that these possibilities have become common knowledge. One point for each of us to remember is that even though these tragic events are important to acknowledge, they must not completely distract us from focusing on improving our collective situation. Though our present times appear bleak, as long as we keep our focus on positive and progressive ends, our future will be bright. The positive side to all of the mayhem is that the truth appears to be winning in a big way. In fact, as things appear, the truth community is gaining so much ground that the MSM seems to be in clear competition with alternative news sources. The fact that the alternative news community is allegedly being targeted and smeared speaks volumes as to how effective and progressive we have been in delivering more truth to the public than the MSM dares to. It may be very soon that the tables will turn completely and the corporate media along with the elitists behind them will answer for the deceptive and destructive tactics they have employed.